Step 1 Bring 4 liters of salted water to a boil. Step 2 Meanwhile, remove skin from yellow zucchinis and discard. Peel long even strips off of zucchini using a vegetable peeler, turning evenly until spongy centre is reached. Step 3 In a large straight sided sauté pan set over medium heat, add cherry tomatoes, olive oil and garlic. Cook tomatoes just until they begin to burst and release their juices. Step 4 Add spaghetti to boiling water and cook according to package directions. Step 5 While pasta is cooking, add peas and asparagus to sauté pan. Stir gently for approximately 3 minutes until just tender. Add zucchini shavings; continue to gently cook for no longer than 3 minutes. Step 6 Strain pasta and add to sauté pan along with basil, lemon juice, lemon zest, parsley, mint, and grated Parmigiano-Reggiano cheese. Gently stir pasta to evenly coat noodles. Adjust seasoning with salt and freshly ground pepper, if desired. Step 7 Plate spaghetti and drop a few spoonfuls of ricotta cheese over top. Garnish with a few leaves of fresh herbs, olive oil and fresh ground pepper. Craving pasta but want to have something healthy too? 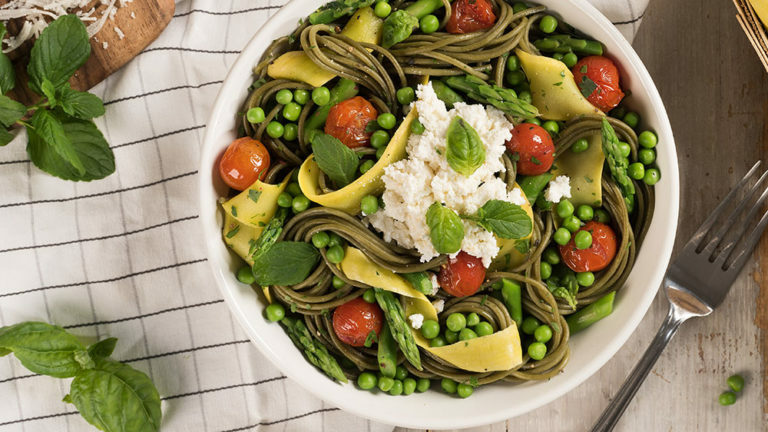 Try this fresh and yummy green spaghetti recipe.